Google Certifications - Why are they Important? Google Certifications: Why Are They Important? What is the best way to choose a Google advertising specialist for your online marketing campaigns? Check their Google certifications and partner status. Home » Blog » Google Certifications: Why Are They Important? What is the best way to choose a Google advertising specialist for your online marketing campaigns? Check their Google certification and partner status. Make sure that your advertising specialist holds valid Google certifications in the field you want to focus on. The next thing you want to do is verify that your advertising specialist holds a valid Google Business Partner Badge. Why is this so important? Just like commercial truck drivers hold a different license than regular drivers, Google wants you to verify whether you are getting a Google Certified Adwords specialist and not just any driver on the Information Super Highway. One of the greatest concerns of Google was to develop trust with the consumer who was participating in the Google auction. This included the ability to help consumers choose valid Adwords specialists. While Google cannot specifically recommend one advertising specialist over another, they can provide a certification process that would easily identify advertisers who had undergone a standardized testing process. Certifications began popping up for almost everything in the 1990’s during the .com boom, especially from companies like Microsoft who wanted to become a leading authority in their field. Actually, it is a very sophisticated form of advertising on the part of Google. Google becomes the authority in the online advertising field and then they provide certifications to people based on their standards. Google even went so far as to provide Google Business Partner Badges that you could place on your website with links to your Google Certified Profile. The presence of a Google Business Partner Badge on a website indicates that the company had to go through a rigorous evaluation process in order to achieve that status. Part of this process is for employees of the company to pass very rigorous Google certification exams. A typical exam would consist of 120 questions and the initial certification for Adwords involves taking two tests, one for Adwords fundamentals and the second would be one of the six specific areas. 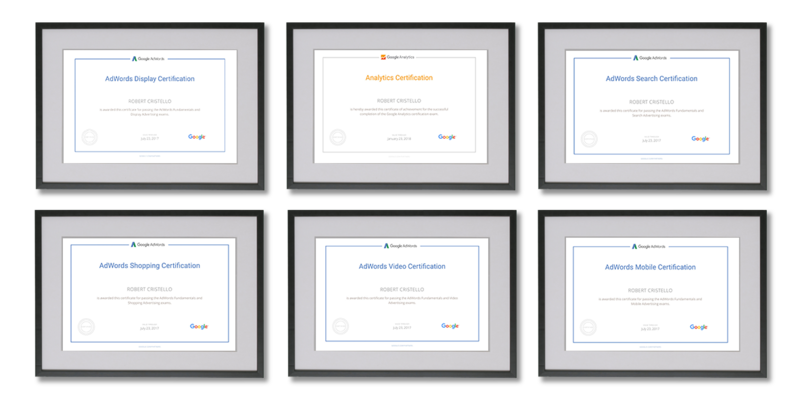 Google Certifications are currently available for Analytics, Adwords Fundamentals, Search, Display, Video, Mobile and even for their Shopping network. The most popular areas would involve the search and the display areas. The search certification involves the actual Google search engine itself. You have probably seen these ads at the top and bottom of your Google search results. These ads are part of the Google auction where people pay money to compete for placement and position. Google is always evolving and one of the more recent exciting developments in this area were the introduction of Google Expanded Text Ads. The second most common area of certification involves the Google Display Network. This is a collection of websites that place Google advertisements on their site and often costs a fraction of the search network. Video certifications involve advertisements that people see in Youtube and Mobile certifications have evolved since Google realized that mobile searches surpassed desktop searches late in 2015. The shopping certification is geared towards the E-commerce client who wants to leverage the Google shopping network to increase sales and improve retention. 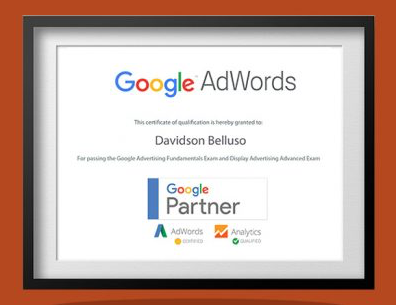 Davidson Belluso employees hold certifications in all areas of Google online advertising and we proudly display the Google Partner Badge in the footer of our website. We have enjoyed a long-standing relationship with Google that we are able to translate into various benefits for our clients. Around here, we encourage a company culture that is based on embracing the newest innovations while applying time-proven advertising strategies. We say with great pride that we are Davidson Belluso, your Certified Google Business Partner. We encourage you to join our mailing list using the sign up box at the very bottom of this page so we can send you exciting news about things to come directly into your inbox. Davidson Belluso, is a full-service marketing communications firm in Phoenix, Arizona, founded in 2001 by Michela Belluso and Rob Davidson. D/B is certified as a Women’s Business Enterprise by the Women’s Business Enterprise National Council (WBENC). With clients from the private, public, government and nonprofit sectors, Davidson Belluso specializes in the healthcare, education, finance and business-to-business industries. Client experience includes Huggies, Petsmart, California Bank & Trust, National Bank of Arizona, CVS/Caremark, Tempe Tourism Office, State of Arizona, Phoenix Sky Harbor International Airport and Arizona State University. Davidson Belluso’s new campaign for First Things First Cochise Regional Partnership Council focuses on early dental care in Southeastern Arizona. Dustin Perrotti joins Davidson Belluso as its newest art director. Before the Big Game, Davidson Belluso’s CEO, Michela Belluso appeared on Fox10 to discuss trends she expected to see in this year’s commercials. How Much Are You Willing to Lose? Organic Vs Paid Marketing: What’s Your SEO Strategy?